LED Indicator, NEUTRAL WIRE REQUIRED, HET06 - White. COUNTDOWN TIMER SWITCH controls the ON/OFF operation of lights, fans, air conditioner and heaters according to the countdown time set. 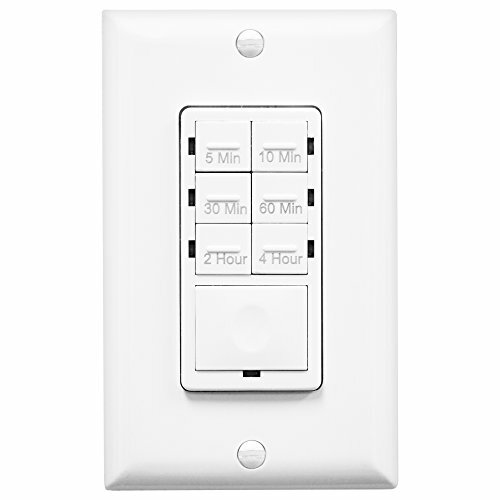 Replaces any standard wall switch and will fit with standard decorator wall plate. 6 PRESET COUNTDOWN TIME OPTIONS: 5, 10, 30 or 60 mins, 2 or 4 hours; Bottom button for re-set. Choose your countdown time based on needs and function. BLUE LED INDICATOR Mode 1: Blue LED light flashes twice indicating setting success then STAYS OFF. Mode 2: LED always on. Depending on where you install the timer switch, you may or may not need the LED light on at all times. ENERGY SAVING SOLUTION for bedroom, bathroom exhaust fans, bathroom heaters, sprinkle system, garage and laundry room applications. BEDROOM FAN TIMER SWITCH Replaces wall switch or spring wound timer, NEUTRAL WIRE REQUIRED.